Madonna put a picture on Instagram of 13-year-old Rocco Ritchie (right photo, center) with two friends, posing with bottles of vodka and gin, captioned: "The party has just begun! Bring it! 2014." 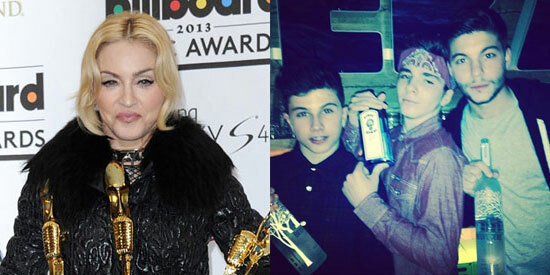 Madonna has come under fire for posting pictures of her teenage son with a bottle of alcohol. The "Die Another Day" singer put a picture on Instagram of 13-year-old Rocco with two friends, posing with bottles of vodka and gin, captioned: "The party has just begun! Bring it! 2014." Madonna is currently holidaying with her family, skiing in Gstaad, Switzerland, where the legal drinking age is 16. While Rocco is seen posing with the bottle of spirits, he is not seen drinking it. Madonna says Rocco didn’t consume any alcohol. She wrote: "No one was drinking we were just having fun! Calm down and get a sense of humor! Don’t start the year off with judgement!" However, Instagram user Abbiesturm was upset, writing next to the picture of Rocco: "I work in addictions and see tragedy daily. I care enough about even Madonnas child to speak my view that it is poor judgment to glorify substances to children." Madonna also raises Lourdes, 17, and adopted David Banda and Mercy James, both eight, and has previously admitted she wishes she were a tougher parent. She said: "I think I am [tough], but honestly I don’t think I’m as tough as I should be. I think I need to be maybe tougher. It’s hard though. Every day is a negotiation."